Modern farming methods threaten isolated communities. The peasants of Romania have until midsummer to make their locally produced cheese, milk, eggs and meat conform to the strict food safety standards of the European Union or they face oblivion. The small road winds steeply up through a valley beside a stream, past beech trees, oaks, and further up, thick stands of pines. It should be almost impassable, in this season, because of the snow. But this year there are only a few stray strands of distant white, like wool caught on the rocks, as we reach Tilisca, then Gales, then Poiana Sibiului - the largest of the shepherding villages. And finally Gina, our destination. Everything has the sweet, musty smell of sheep here - the main street, the mayor's office, but most overpowering of all, the cheese cellars. Elena and Sawa, sisters whose families own 250 sheep or so apiece, scoop great square ingots of rich cream-coloured cheese out of the pine barrels for me to sample. It tastes rather like Greek feta. The cheese rests here, in salted water, waiting for the trip to market in Bucharest - six hours drive to the south. Those in the village who do not have sheep transport the cheese and do the selling - in 20 or so big open markets in the capital where sheep's cheese from Sibiu - brinza they call it here - is especially prized. 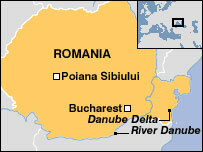 In fact it is a key ingredient, grated into Romania's national dish - polenta. From the window of the mayor's office, every green hilltop, as far as the eye can see, is neatly fenced off into sheep folds. But there is hardly a sheep to be seen - the men take them down to the plains each October, as they have done for centuries, to escape the mountain snows and ice. 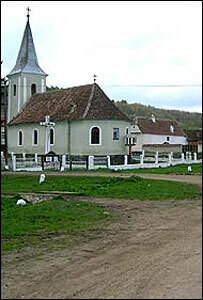 Georghe walks for two months, to Baia Mare in the north. Others herd them down to the Danube delta, where their charges bleat beneath the honking geese from Siberia, who winter there also. In Prince Michael of Wallachia's time, in the 14th Century, the shepherds of this strip of the Carpathians had the right to pasture their sheep as far away as the Crimean peninsula. Sometimes they were gone for years. Under the Austro-Hungarian monarchy, they carried carved wooden passports - each sheep notched on the back. For centuries they have battled with the wolves and bears which still cling, like them, to these mountains. But now they face the biggest danger yet, the bureaucrats of Bucharest and Brussels. "I'm not against traditional producers," says Marian Avram, the head of the Food Safety Inspectorate in the Romanian capital. "But I am against extremist traditionalism." For a moment he makes it sound like the latest front in the war on terror. 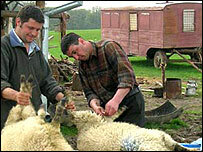 EU regulations threaten the future of many farmers. "The peasants only have themselves to blame," he continues, "squandering their income on luxury cars, instead of investing it in milking technology". Over mouthfuls of salty cheese in her cellar, I ask Elena about luxury automobiles. "I married at 17," she says. "We've got a horse, but we've never had a car." Her family makes roughly 2,500 kilos of cheese a year. Ten kilos per sheep, in the milking months from May to October which they sell to the merchants for up to 10 New Lei (£2) a kilo. It is their only cash crop. And they have to pay for fodder in winter, and the rent of the meadows in summer. The men bring the sheep back to the mountains at Easter, and all the family helps in the sheepfolds, milking morning and evening, and making the cheese. The most remote sheepfolds can be six hours walk from the nearest road. But now the new regulations encourage the building of cheese factories with stainless steel vats, instead of wooden barrels, within easy reach of the inspectors. "In the summer heat, how are we going to get the milk to the main road?" ask the shepherds. "And where will the money come from to build factories?" "And anyway the cheese wouldn't taste the same", an old man outside the mayor's office tells me. The new regulations leave one loophole - to register as traditional producers. But can all the documents be filled out in time? Will inspectors have to check each and every sheep - 39,000 belong to the shepherds of Gina alone - and nearer 50,000 in the biggest village. The system seems tilted, as ever, to factory production, supplying spotless, sanitised supermarkets with identical items. But do you actually like the taste of brinza? I asked the chief inspector. "Yes," he replied, "if I'm sure it's not going to poison me". In her front room in Gina, Maria Sterp sings of the life in the mountains in her youth. The handsome, flute-playing shepherds, the maids-a-milking, and the children, rounding up the animals. Young people want to watch television, and play on computers nowadays, not look after sheep, she laments. The new law will speed up the end of a way of life already in decline. Year by year, the mountains are getting lonelier, she sings. Soon the only people left will be tourists. From Our Own Correspondent was broadcast on Saturday, 27 January, 2007 at 1130 GMT on BBC Radio 4. Please check the programme schedules for World Service transmission times.